Pop any one of the three music CDs into your own CD player. Listen to the commands of the jamming DJs and see if you can keep up by twisting, dancing, jumping, and turning. 144 electrifying dance sessions will keep you moving and grooving for hours and hours. Includes 3 CDs and 4 mats. Includes exclusive Nick Cannon or Aaron Carter single music. 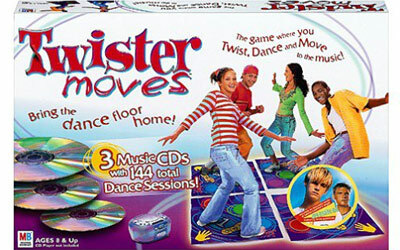 Twister Moves is for 1-4 players.